What Iis a DA Form 3434? DA Form 3434, Notification of Personnel Action - Nonappropriated Funds Employees is a form used as written documentation of a personnel action that affects a non-appropriated funds (NAF) employee’s position or pay. The latest version of the form – sometimes incorrectly referred to as the DD Form 3434 – was released by the Department of the Army (DA) in June 1993 with the February 1989-issued forms being used until exhausted. An up-to-date DA Form 3434 fillable version is available for download and online filing below or can be found through the Army Publishing Directorate website. In case of separation, regular full-time (RFT) and regular part-time (RPT) employees will receive written notice in a minimum 30 days in advance. For flexible (FLX) employees who have been more on the rolls for than 3 years this term is reduced to 7 days. A reduction of pay rate may be applied to NAF employees only and requires at least 30 calendar day advance written notification. If an RFT employee is changed to FLX or RPT, an RPT is converted to FLX, and an RTF or RPT employment category is changed to seasonal, the corresponding employee will receive a written notice 30 days in advance. Furlough is appropriate only for RFT & RPT employees. It is a non-duty, non-pay status. The notification period length, in this case, is equal to the length of the furlough. If furlough excess 30 days, the notification should be provided 30 days in advance. All filing regulations and information about the DA 3434 can be found in the Army Regulation 215-3, Nonappropriated Funds Instrumentalities Personnel Policy, released in September 2015. 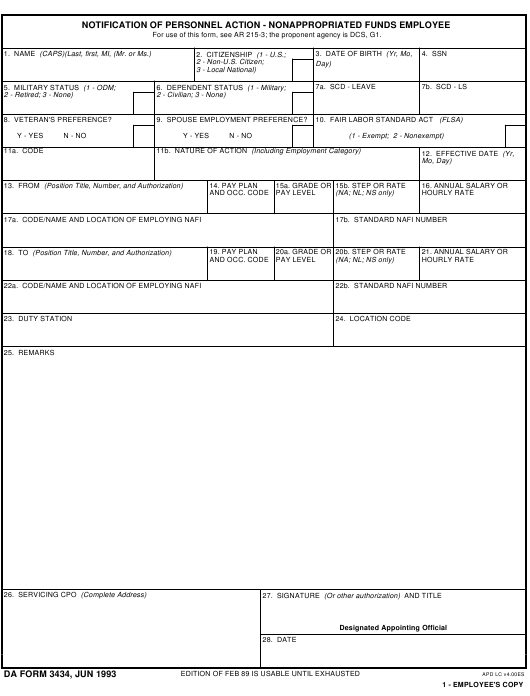 The Federal form DA 3434 is issued in six copies. These include an employee's copy, a payroll copy, a retirement copy, a personnel folder copy, a personnel records file copy, and a supervisor's copy. The document should contain personal information, necessary for identification, like the name, citizenship, date of birth and SSN of the employee. If the employee has any veteran's or spouse employment preferences, they are also reflected in the paper. Most part of data in the Form DA 3434 is entered in form of appropriate standard codes. If any additional written details are required, they may be provided in Box 25. The full address of servicing CPO goes in Box 26. To be valid, the document should be dated and signed by a designated appointing official.